In our exhibition ‘The Kangaroo and the Moose’ (http://tinyurl.com/jr3oplu) a kangaroo and some butterflies that once, 250 years ago, may have roamed in the same place once again occupy the same space. The kangaroo is George Stubbs’s famous painting and the butterflies are dead pinned specimens collected by Joseph Banks. I am rather taken with the idea that all those years ago the living animals occupied the same time and space and through happenstance became part of scientific history – it is a fascinating story to share. When we first considered a context for the Stubbs kangaroo painting coming to the Hunterian, several connections came to mind – the collection here is fortunate enough to contain other works by George Stubbs, and also specimens collected on the Cook voyages. That these marvellous items are here is due to our founder, William Hunter, 18th century anatomist, doctor and Enlightenment man. He was a significant figure in scholarly and social world surrounding Joseph Banks. The latter accompanied Captain James Cook as expedition naturalist on the first voyage to the South Seas (1768 – 1771). Hunter built up stunning collections including art, books, coins and natural history and it is in this latter area that we focused part of the exhibition. 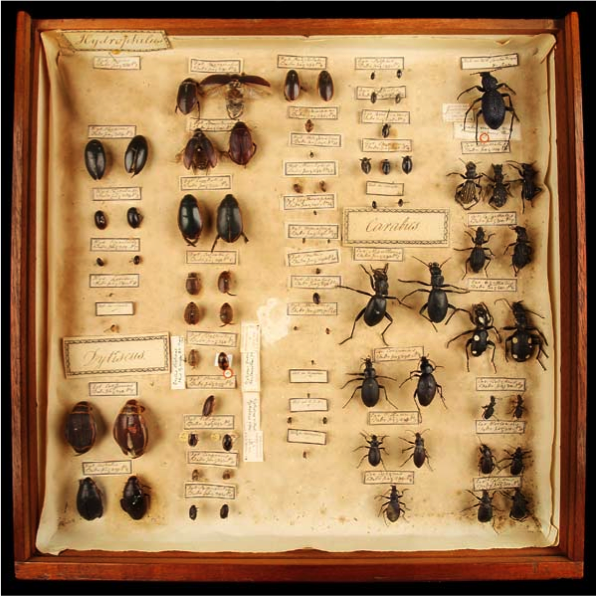 Insects, shells and corals are the principal survivors of Hunter’s zoology collections today – sadly only a few of his many vertebrate specimens have made it to the 21th century. By contrast, the insect collection survives virtually intact – it is a curious but welcome quirk of fate that fragile pinned insects have endured the centuries but not the seemingly more robust vertebrates. Australian butterflies from Banks collection are in the Hunter collection and these struck me particularly with the sense of history that this material engenders. Captain Cook reached Australia in 1770, sailing up the east coast to chart previously unknown territory. His ship, the Endeavour, nearly had a disaster when it struck the Great Barrier Reef and was seriously holed. It had to be hauled out for repair and this took several weeks. The unexpected delay allowed the ship’s naturalists lots of time for collecting and these butterflies were taken then. They are found in NE Australia and known locally as the ‘Big Greasy’ – their modern scientific name is Cressida cressida. We have put a male and a female from the collection on show and in fact they were initially described as different species until it was realised they are sexually dimorphic. If you look closely at the originally 18th century label above the females, there is a tiny letter ‘B’ in the corner. This indicates the specimens were originally in Joseph Banks’ collection and Hunter received them as a gift. At the same time, here at the Endeavour River, Cook, Banks and others first spotted a weird animal they had never seen before. Comparing it variously to a mouse, goat, hare, greyhound and jerboa, they eventually shot a ‘kangaroo’ (for the pot! ), preserving only some skulls and skins to take back to England as evidence of this brand new animal. The voyage artist Sydney Parkinson made two pencil sketches of it to which Stubbs eventually may or may not have had access ( depends on who you read…). This material, along with personal accounts was all that George Stubbs had to go on to paint the kangaroo for Banks. Though not perfect, I think he did a reasonable job in the circumstances….. The kangaroo species depicted was subsequently identified as a young male Eastern grey, Macropus giganteus.